NO SALES TAXES IN ANY STATE EXCEPT California! 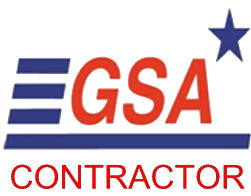 We are GSA Contractors. GSA pricing is available to all federal, state, county & local government agencies. Contact us for GSA prices. SEE SPECIALS BUTTON ABOVE FOR CURRENT SPECIALS IN STOCK! Our California electrical contractor, for residential, commercial and industrial installations is Vince Sigal Electric, in Santa Rosa, CA Call: (707) 526-6403. I will take your order! See our Generator Catalog below ! We have the best mobile mounted generator sets on the market! Let us build what you need for the coming year. Diesel and NG units for use in the oil fields. Nobody gets the job done like GeneratorJoe! Best In The Industry ! GeneratorJoe is simply the best online retailer for diesel generators in the United States. All products are MADE IN AMERICA! We are committed to our business, our customers, and the industry. We maintain the highest standards of excellence, without charging higher prices. Our customers love us and keep coming back! If you need a few more reasons why you should buy a generator from GeneratorJoe over other diesel and NG/LP generator sellers, please continue reading. Below are our best and most honored customers. Thanks to all our service members and their civilian support staffs for protecting us and our county. As a fellow veteran we salute all who have served. GeneratorJoe is the #1 online retailer for diesel and NG/LP generators in the United States. We didn't get there by underselling our products and customer service, or by overcharging our customers. We earned the loyalty of our customers by fair pricing, great customer service and honest business practices. We have the best prices and the largest selection of products for your industrial, commercial and residential generator needs. We specialize in trailer mounted diesel and NG/LP mobile generators for the oil/gas, mining and rental industries. We also sell RV and commercial mobile generators for vehicles. If you need transfer switches. large fuel tanks and other on-site equipment to support your generator, we can provide what you need at the best prices available. GeneratorJoe is the only diesel and NG/LP generator manufacturer that provides customers with the resources they need to make the right decision for their generator requirements. Whether you want to buy a portable gasoline or diesel generator, industrial diesel or NG/LP generator, we have what the information and products, at the best prices that you are looking for. We provide factory brochures, complete product descriptions and comparison tools for every generator category we sell. Our website system automatically calculates your system price in real time to show sales prices, shipping costs, and compatible accessories. We are friendly and fair! 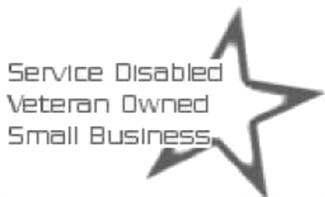 We are a 100% Disabled Veteran owned small business. 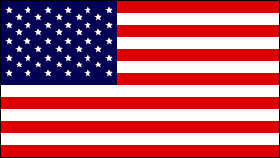 All products we sell are MADE IN THE USA!. We take care of our employees and our customers. If you have question about purchasing a diesel or NG/LP generator or any of our products, please call us or email us directly and we will answer. Hello ! 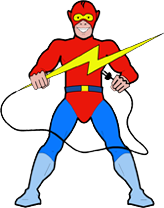 GeneratorJoe ! Reason #4 - Because no one else can do what we do! GeneratorJoe is the only company that offers a website capable of showing its customers all products and options with prices and shipping fees - in REAL time. We are the only website that offers our customers the option to search for diesel generators, buy a generator, or lease a generator without having to make a phone call or visit a retail location. We made the commitment years ago to build a website that could offer our generator customers this kind of convenience, expert information and support. For over 10 years we have been leaders in the industry offering consumers the best selection of high quality products and lowest available prices. Many other generator sellers have come and gone, but GeneratorJoe is here to stay! We Sell Generators from: Cummins, Detroit Diesel, Doosan, GeneratorJoe, GM, Honda powered, Inveco, Isuzu, John Deere, Kohler, Kubota, Lister Petter, Mitsubishi, MTU, MQ Power, Nissan, Onan, Perkins, Terex, Volvo, Yanmar and others. We sell ASCO, GE Zenith transfer switches at the lowest prices in the USA. We have ESCO Transfer switches for RV's and boats. The Generator Industry's BEST Warranty! Included in the price on most models! All GeneratorJoe industrial and mobile generators have an industry exclusive 5 year, 5,000 hour warranty. No other manufacturer, OEM, dealer or seller offers this warranty without extra fees. Howe do we do it? We build our generators right the first time! 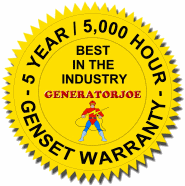 Contact us today to order your GeneratorJoe generator with the industry's BEST Warranty of 5 Years, 5,000 Hours. We know how to get the job done. We specialize in building units in stock for you quickly and at a great price. Multiple matching units, large sizes, specially equipped units are no problem for us. You need it and we will do the best we can to find it for you and negotiate a fair price. Our competitors refuse to show you prices and have no way for you to check prices online. Why? Because they want to size you up and see how much you know about generators and generator prices. They will charge you what they can and charge you even more for freight. GeneratorJoe sells all products to all customers at the same price. GeneratorJoe shows you our prices and suggested list prices on every single product! We have nothing to hide and don't play games with your money or your head. See Our Competition for more information. Our Competitors have No Shopping Cart? Why? In this modern age of computers any company can maintain a decent website and show you what they offer. If they DO NOT offer you a shopping cart showing all products and options WITH prices, you should question their commitment to the business. If they are internet sellers and they will not spend money on a decent website, how long will they be around? GeneratorJoe has the most sophisticated and modern website in the entire industry! Our database driven state-of-the-art system provides detailed model data (including fuel consumption), factory brochures, specification summaries and comparison tables on over 700 generators, combinations and options. We don't have a few brands that we try to force fit your requirements into, we provide many brands and one of them perfectly fits your needs. GeneratorJoe provides online real-time freight quotes, online real-time leasing and prices so you can buy it right now. We will be happy to help you with any purchase or provide expert engineering assistance. Just call GeneratorJoe at 707-542-2224 or write sales@generatorjoe.net. We have it all: portables, RV, mobile commercial, commercial, residential, industrial, mobile trailer mount, container clip-on and mobile lighting too. We have all fuels, gasoline, diesel, LPL, LPV, Natural Gas, duel and multi-fuel. We also have the lowest transfer switch prices on the internet with FREE SHIPPING when you buy a switch with a generator. Buy where the government and major corporations buy Click Here for a partial list, The Fortune 10,000 buys here! We have more generator brands, more generator models and the lowest generator prices with the best warranty. We sell small diesel generators, propane generators, natural gas( NG) generators, portable generators, home generators, emergency generator, commercial generators, gasoline generators, marine generators, transfer switches, automatic transfer switches, asco transfer switches, diesel generator, military generators, generator trailers, fuel trailers, generator controls and more. Many ways to shop for generators, shop by generator size, shop by generator watts, shop by generator brand, shop by generator category, shop by generator fuel.